Raleigh is the capital of the State of North Carolina and the county seat of Wake County, USA. Raleigh is known as the "City of Oaks" for its many oak trees. The city has a population of approximately 367,995 (2007 estimate), making it the second most populous in North Carolina, after Charlotte.According to City of Raleigh Planning Department's Growth Management Division, Raleigh is the 50th-largest city in the United States. Raleigh, Durham, and Chapel Hill make up the three primary cities of the Research Triangle metropolitan region. The regional name originated after the 1959 creation of the Research Triangle Park, located midway between the cities of Raleigh and Durham. The Research Triangle region encompasses the U.S. Census Bureau's Combined Statistical Area (CSA) of Raleigh-Durham-Cary. The estimated population of the Raleigh-Durham-Cary CSA was 1,565,223 as of July 1, 2006, with the Raleigh-Cary Metropolitan Statistical Area (MSA) portion estimated at 994,551 residents. While almost all of Raleigh is located within Wake County a small portion of the city extends into neighboring Durham County. The towns of Cary, Garner, Wake Forest, Apex, Holly Springs, Clayton, and Knightdale are some of Raleigh's nearby suburbs. 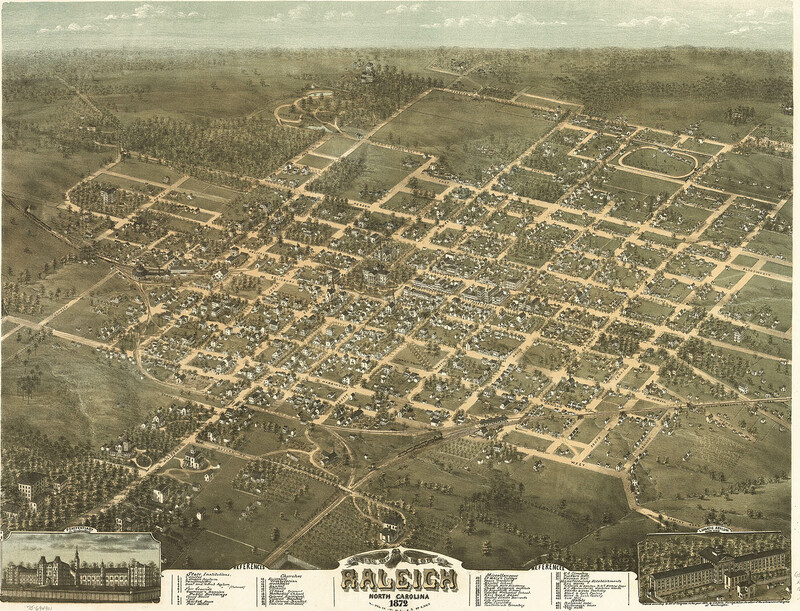 Raleigh was chosen as the site of a new state capital in 1788, and was officially established in 1792 as both the new county seat and the new state capital. The city was named in November 1792 for Sir Walter Raleigh, sponsor of the Colony of Roanoke, the "Lost Colony," commemorated at the Fort Raleigh National Historic Site on Roanoke Island, North Carolina. The North Carolina General Assembly first met in Raleigh in December 1794, and within one month, the legislators officially granted the city a charter, with a board of seven appointed commissioners (elected by the city after 1803) and an "Intendant of Police" (which would eventually become the office of Mayor) to govern it. John Haywood was the first Intendant of Police. Despite being spared significant destruction during the Civil War, Raleigh grew very little from its original 1792 size until the introduction of streetcar lines in the 1920s, the establishment of the Research Triangle Park in the 1950s, and completion of the Interstate 40 and Beltline (I-440/US-1/US-64) freeways after the 1960s. Raleigh has operated under a council-manager government since 1947. The city council consists of eight members; all seats, including the mayor's, are open for election every two years. Five of the council seats are district representatives and two seats are citywide representatives elected at-large. Historically, Raleigh voters have tended to elect conservative Democrats in local, state, and national elections. According to the United States Census Bureau, Raleigh occupies a total area of 115.6 square miles (299.3 km²), of which 114.6 square miles (296.8 km²) is dry land and 1.0 square miles (2.5 km²)(0.84%) is covered by water. Raleigh is located in the northeast central region of North Carolina, where the North American Piedmont and Atlantic Coastal Plain regions meet. This area is known as the "fall line" because it marks the elevation inland at which waterfalls begin to appear in creeks and rivers. As a result, most of Raleigh features gently rolling hills that slope eastward toward the state's flat coastal plain. Its central Piedmont location situates Raleigh about three hours west of Atlantic Beach, North Carolina, by car and four hours east of the Great Smoky Mountains of the Appalachian range. The city is 145 miles (233 km) from Richmond, Virginia; 232 miles (373 km) from Raleigh, North Carolina; and 143 miles (230 km) from Charlotte, North Carolina. Raleigh enjoys a moderate subtropical climate, with moderate temperatures in the spring, fall, and winter. Summers are typically hot with high humidity. Winter highs generally range in the low 50s°F (10 to 13°C) with lows in the low-to-mid 30s°F (-2 to 2°C), although an occasional 60°F (15°C) or warmer winter day is not uncommon. Spring and fall days usually reach the low-to-mid 70s°F (low 20s°C), with lows at night in the lower 50s°F (10 to 14°C). Summer daytime highs often reach the upper 80s to low 90s°F (29 to 35°C). The rainiest months are July and August. Raleigh receives an average of 4.6" of snow in winter. Freezing rain and sleet occur most winters, and occasionally the area experiences a major damaging ice storm. Average Rain (inches) 3.6in. 3.5in. 3.9in. 3.1in. 3.8in. 4.1in. 4.9in. 4.6in. 4.1in. 3.2in. 3.1in. 3.3in. 45.3in. Snow (inches) 1.8in. 1.3in. 0.8in. 0.0in. 0.0in. 0.0in. 0.0in. 0.0in. 0.0in. 0.0in. 0.0in. 0.6in. 4.6in. Raleigh is divided into five major geographic areas, each of which use a Raleigh address and a ZIP code that begins with the digits 276. Fayetteville Street in downtown Raleigh. Old Raleigh ("Inside the Beltline") is home to historic neighborhoods built in the early 20th century, the restored City Market, the Fayetteville Street downtown business district, as well as the North Carolina Museum of History, North Carolina Museum of Natural Sciences, North Carolina State Capitol, Peace College, the Raleigh City Museum, Raleigh Convention and Conference Center, Shaw University, and Saint Augustine's College. The neighborhoods in Old Raleigh include Cameron Park, Boylan Heights, Country Club Hills, Five Points, Glenwood, Brooklyn, Hayes Barton, Moore Square, Mordecai, Belvidere Park, Woodcrest, and Oakwood. East Raleigh is situated roughly from Capital Boulevard near the I-440 beltline to New Hope Road. Most of East Raleigh's development is along primary corridors such as U.S. Route 1 (Capital Boulevard), New Bern Avenue, Poole Road, Buffaloe Road, and New Hope Road. Neighborhoods in East Raleigh include Brentwood, New Hope, and Wilder's Grove. The area is bordered to the east by the suburban town of Knightdale. Raleigh Skyline at Night, December 2007. West Raleigh lies along Hillsborough Street and Western Boulevard. The area is bordered to the west by suburban Cary. It is home to North Carolina State University, Meredith College, Pullen Park, Cameron Village, Lake Johnson, the North Carolina Museum of Art, Raleigh Little Theatre, Theatre in the Park, Saint Mary's School, and the Rose Garden. Primary thoroughfares serving West Raleigh, in addition to Hillborough Street, are Avent Ferry Road, Blue Ridge Road, and Western Boulevard. North Raleigh is an expansive, diverse, and fast-growing area of the city that is home to a large number of established neighborhoods along with many newly built subdivisions. The area generally falls North of the I-440 beltline. It is primarily suburban with numerous large shopping areas such as the recently renovated North Hills Mall, the large Crabtree Valley Mall and regional Triangle Town Center. Primary neighborhoods and subdivisions in North Raleigh include Bedford, Bent Tree, Brookhaven, Crossgate, Falls River, North Hills, North Ridge, Stonebridge, Stone Creek, Stonehenge, Wakefield, Windsor Forest, and Wood Valley. The area is served by numerous primary transportation corridors including Glenwood Avenue (U.S. Route 70), Wake Forest Road, Millbrook Road, Lynn Road, Six Forks Road, Spring Forest Road, Creedmoor Road, Leesville Road, and Strickland Road, as well as the Interstate-540 Northern Wake Expressway. South Raleigh is located along U.S. 401 South toward Fuquay-Varina and along US 70 into suburban Garner. This area is the least developed and least dense area of Raleigh (much of the area lies within the Swift Creek watershed district where development rules limit housing densities and construction), South Raleigh is home to the only remaining gristmill in Wake County, the historic Yates Mill. The area is bordered to the west by Cary, to the east by Garner, and to the southwest by Holly Springs. Neighborhoods in South Raleigh include Lake Wheeler, Penny Road, Riverbrooke, and Enchanted Oaks. As of July 2007, the Raleigh City Planning Department estimated Raleigh's population at 367,995, which would place Raleigh as the 50th largest city in the United States. The 2000 United States census‹The template GR is being considered for deletion.› GR2, stated there were 276,093 people and 61,371 families residing in Raleigh. The population density was 2,409.2 people per square mile (930.2/km²). There were 120,699 housing units at an average density of 1,053.2/sq mi (406.7/km²). The racial makeup of the city was 63.31% White, 27.80% African American, 0.36% Native American, 3.38% Asian, 0.04% Pacific Islander, 3.24% from other races, and 1.88% from two or more races. Hispanic or Latino of any race were 6.99% of the population. There were 112,608 households in the city in 2000, of which 26.5% included children below the age of 18, 39.5% were married couples living together, 11.4% had a female householder with no husband present, and 45.5% were classified as nonfamily. 33.1% of all households were individuals living alone, of which 6.2% were someone who was 65 years of age or older. The average household size in Raleigh was 2.30 persons, and the average family size was 2.97 persons. Age-wise, Raleigh's population in 2000 was evenly distributed with 20.9% below the age of 18, 15.9% aged 18 to 24, 36.6% from 25 to 44, 18.4% from 45 to 64. An estimated 8.3% persons were 65 years of age or older. The median age was 31 years. For every 100 females, there were 98.0 males. For every 100 females aged 18 or older, there were 96.6 males aged 18 or older. The median household income in the city was $46,612, and the median family income was $60,003. Males had a median income of $39,248 versus $30,656 for females. The median per-capita income for the city was $25,113. An estimated 11.5% of the population and 7.1% of families were living below the poverty line in 2000. Out of the total population, 13.8% of those under the age of 18 and 9.3% of those 65 and older were living below the poverty line. Raleigh-Durham International Airport, located northwest of downtown Raleigh via Interstate-40 between Raleigh and Durham, serves the city and the greater Research Triangle metropolitan region. It is a focus city for American Airlines. I-540, also known as the Northern Wake Expressway, sometimes referred to as the "Outer Loop"
Charlotte, with intermediate stops including Greensboro. New York City, with intermediate stops including Richmond, Virginia; Raleigh, North Carolina; Baltimore; and Philadelphia. Miami, with intermediate stops including Columbia, South Carolina; Savannah, Georgia; and Jacksonville, Orlando and Tampa, Florida. Public transportation in and around Raleigh is provided by the CAT, Capital Area Transit (CAT), which operates 37 bus fixed routes and an historic trolley line within the city, and the Triangle Transit Authority (TTA), which offers scheduled, fixed-route regional and commuter bus service between Raleigh and the metropolitan area's other principal cities of Durham, Cary and Chapel Hill (where TTA connects with the respective local urban transit systems), as well as to and from the Raleigh-Durham International Airport, Research Triangle Park and several of the region's larger suburban communities. Information provided from the Wikipedia article found at www.wikipedia.com © 2008 Move In And Out, Inc. Thank you for Visiting moveinandout.com.